In January 1980, a couple of months after I started dating my future wife, my parents gave me a choice. I can either go to Disney World with the rest of the family, or I can have my first real personal computer — a TRS-80 Model 1, with 4k of RAM and Level 1 BASIC. It was a no-brainer. First, the computer lasted a lot longer than the trip, and second (and more importantly), I had just started going out with Lorri, and I didn’t want to go away. This was one of the easiest and best decisions I’ve ever made. I’ve never looked back from either benefit. Although this wasn’t actually a user group experience, it was my first taste of what being part of a larger community of “tribe members” felt like. I had discovered that there were many other people out there who shared my passion, and who I could learn from. It was addicting. I devoured everything about the computer, and all other computers in my life from that point forward. It wasn’t until the late 80s that I had my first exposure to a real user group. A friend of mine brought me to the Clipper User’s Group at MLK High School on Amsterdam Avenue in NYC. Wow — these are my people! I was hooked. I went to every meeting from that point forward for several years, while Clipper was my primary programming tool, and met some amazing people. That group also kick-started me on getting my first commercial product released, when my business partner and I did our first demo at one of the meetings. That group also became the model for regular team meetings I held for my consulting company throughout the 90s. We were all passionate about programming, and it was a way for us to get together to learn and discuss technology for technology’s sake — not just in a work environment. When I closed up my company, and started working at my next job, I finally got involved full-time with Microsoft technologies. But because I worked far from NYC, I rarely went to user group meetings anymore. Occasionally, I’d attend a developer’s conference or something. It was a rare, exhilarating experience being around like-minded people in a learning environment. It continued to stoke the flames of my passion for programming. But as some of you may know from earlier blog posts, my career started to move away from programming into management during the mid to late 2000s. I’d try to get to .NET user group meetings in NYC, and still try to get to developer conferences (on my own dime, now that I was in management) as often as possible. But I started to feel like an outsider. I still felt like the attendees and speakers were part of my tribe, but I started to feel like an impostor. Since I was unhappily in management, I needed to do something to keep up with the development world, as well as stay connected to what I considered my tribe. I did find a user group close to work, in Stamford, CT, but it was held with less and less consistency. It was getting more difficult for me to make it to user group meetings in NYC, but when I attended one in late 2006, I asked one of the leaders of the NYC .NET Developer’s Group, Bill Zack, if I could make an announcement. Although I had absolutely no idea yet how and where I could pull this off, I announced that I wanted to start a .NET user group up in Westchester, near where I lived. I mentioned that I’d make further announcements when it became a reality, and asked people to contact me if they’d be interested in a group in that area. It was after this meeting that Bill and Peter Laudati, the Microsoft Developer Evangelist in the area, made me aware of INETA (which is celebrating their 10th anniversary this month). They gave me some suggestions, including resources from INETA, for getting the group started. I dug through the material, and my wife and I started looking for a local venue that could support such a group for free (since user groups are all virtually free for their members). We had very little luck. Most places wanted to charge, or required liability insurance. Sadly, I put off this idea for a while, still trying to get to the NYC meetings as often as possible. In May of 2007, I was contacted by Bill Zack, who mentioned that Louis Edouard (who used to run the Stamford group at UConn, but was finding it overwhelming to do it all himself), and Leo Junquera, a fellow geek from the local business community, were looking to restart the group at UConn. They were looking for a third volunteer to help with the rebirth. I jumped at the opportunity. Since it was held close enough to Westchester as well, and was easier for local folk to get to rather than NYC, we decided to restart the group under a new name: The Fairfield / Westchester .NET User Group. We had our first meeting in June, 2007, and the rest, as they say, is history. Since then, I’ve been heavily involved in running eight code camp events and two monthly user groups (we also run a SQL Server group at UConn). It’s been incredible. Not only am I living the dream of actively participating in a community of like-minded “geeks,” it’s also given me the confidence to get back into full-time development, and I no longer feel like an outsider impostor. This is my tribe, and we share a common passion. We love to learn, and our interest in development lives well beyond the walls of work. 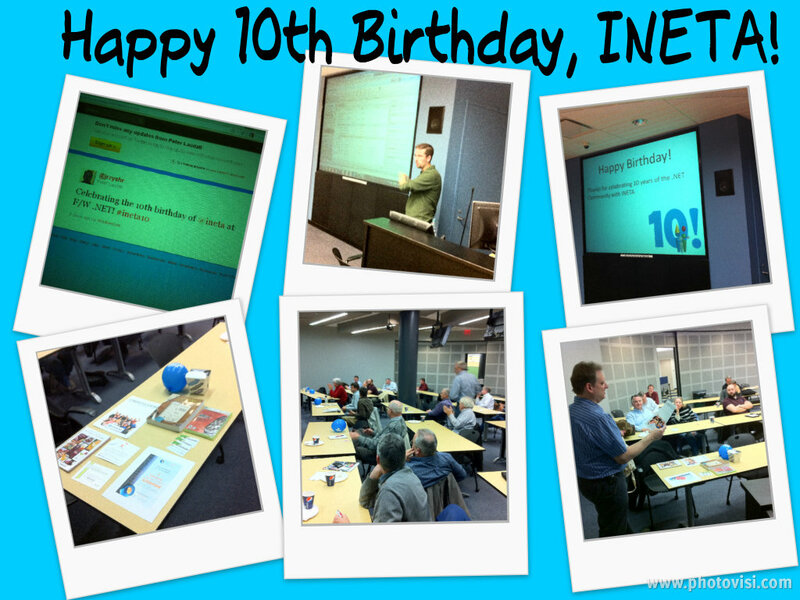 Happy 10th birthday to INETA, the group which is instrumental in building our tribe of passionate geeks! If you’re a like-minded individual, and you really care about this field (and your career), I urge you to join a local user group. You can find one near you by checking the listings on the INETA site.